Egypt’s President Abdel-Fattah El-Sisi says there is an “imbalance” in the credibility of the United Nations, especially when it comes to the Arab region and the African continent. 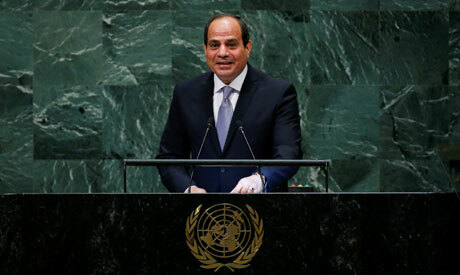 In a speech in front of the 73rd United Nations General Assembly, El-Sisi said he speaks for those who question the integrity and the values of the UN at a time of “disintegration” and “collapse” of nation states. “How do we blame an Arab who questions the integrity of the UN and what it represents in values at a time when his region is endangered with dissolution and the collapse of the nation state before a wave of terrorism and sectarian conflicts that drain the capabilities of Arab states?” El-Sisi said. The president added that the same Arabs would wonder why the Palestinian people have not obtained their legitimate rights to live in dignity and peace in an independent state that reflects their national identity, aspirations, and wishes. “Is it possible that an African is seen as exaggerating if he complains about the lack of efficiency of the international order as his continent faces an economic regime that establishes poverty, inequality, and the reproduction of social and political crisis, and does not offer aspect for developments?” he questioned. “I present to you the questions of our nations, as Egypt chairs the Group of 77 and China, which constitute the majority of this world’s population,” El-Sisi said. El-Sisi said that developing countries cannot tolerate living amid an international order that is not governed by law and lofty principles, upon which the UN was established; and is in threat of polarisation and attempts by some to dominate the international order based on their affiliations within the international community. The Egyptian president said there is no room for the international order to function if the principle of the nation state, which is based on the values of citizenship, democracy, and equality, is threated with disintegration. “I speak from the experience of Egypt as a nation that has exerted massive efforts to recover its state and save its identity, and chose its nation state to be the door for reform and the achievement of aspirations for freedom, honour, and development,” he said. El-Sisi added that the disintegration of states in civil conflicts and the relapse of sectarian allegiance as an alternative to national identity is responsible for the modern world’s most dangerous phenomena such as armed conflicts and the outbreak of human trafficking, illegal migration, organised crime and the illegal trade in arms and narcotics. “There is no doubt that the Arab region faces the worst in terms of the fragmentation of nation states and what follows in a rich atmosphere for terrorism and sectarian conflicts,” he said. “The perseverance of states comes as a top priority for Egypt’s foreign policy in the Arab region,” he stressed. Speaking on Syria and Yemen, El-Sisi stressed the importance of the recovery of the nation state and safeguarding of its sovereignty and the safety of its institutions while meeting the legitimate aspirations of its citizens. “Egypt is a leading supporter of political resolutions led by the UN in the two countries; refusing any exploitation of the hardships of people in Syria and Yemen as a means to serve regional greed and interference, or as an incubator for terrorism, extremism, and sectarianism,” he said. On Libya, El-Sisi said that his country has a pivotal role in supporting the reconstruction of the state, especially when it comes to the unity of its military institutions to offer a structure that is able to defend Libya and face the dangers of terrorism. “A year has passed since the UN adopted an initiative for a comprehensive plan to resolve the Libyan crisis without any progress in executing [the plan], which calls on us to reiterate our commitment to the political resolution as outlined by this initiative,” he said, adding that there is no room for incomplete resolutions on Libya, as well as Syria and Yemen. Moreover, he said that such crises need comprehensive treatments and not partial solutions if we wish to overcome the depletion of human beings and resources and start construction. The president spoke about the need for commitment to finding peaceful and sustainable solutions for international conflicts, which was a main goal of the initial founding of the UN. “Despite the UN’s role in South Sudan and Central Africa; it remains incomplete when it comes to reaching a final settlement for the conflicts. There is a dire need for support for countries surviving past conflicts and rehabilitating their institutions,” he said. “There is no time to waste in conflicts regarding the matter. What is needed is a political determination to resume negotiations and hasten reconciliation in accordance with these accords,” he said. E-Sisi also spoke about the 2030 development vision by the UN. “Reform of the global economic system cannot be postponed; we look up to the UN as a gateway for ideas to achieve this reform, especially within a mechanism that stops a stream of illegitimate funding in developing countries,” he said, adding that these are key principles required to reassert the UN’s integrity. He spoke of a need to boost the partnership between the UN and regional institutions, highlighting the cooperation between the UN and the African Union as an exemplary model in burden-sharing. “As Egypt approaches his chairmanship of the AU in 2019, we look forward to activating strategic partnership between the AU and UN,” he said. The president highlighted Egypt’s domestic efforts, including the comprehensive anti-terrorism Operation Sinai 2018, to fight and eradicate terrorism. “We assert that the magnitude of funding for terrorist groups, as well as the ease by which foreign terrorists travel, indicate that there is no way other than establishing an international anti-terrorism system,” he said. El-Sisi added that the protection of human rights will not be achieved with media campaigns of defamation and a neglect of all fields of human rights, including economic, social and cultural rights. “We have a constitution which is based on preserving human rights, as well as advancing the empowerment of women and youth,” he said. According to El-Sisi, women in Egypt now hold 25 percent of ministerial positions, and more than 15 percent of parliament seats. Youth are also being relied on in leading positions, as well as conferences on youth to address their challenges and capabilities. “We are keen on putting the issues of women and youth empowerment, as well as scientific research and innovation, at the top of our priorities in the Group 77 and China,” he said. El-Sisi restated the need to recover the integrity of the UN, before ending his speech with his symbolic and well-known “Long Live Egypt” motto three times.